This beetle was spotted on a stem of California Buckwheat (Eriogonum fasciculatum) at the Claremont Colleges’ Robert J. Bernard Biological Field Station. I wondered if it might be a metallic wood-boring beetle (Buprestidae)? Any information about its identity will be greatly appreciated! 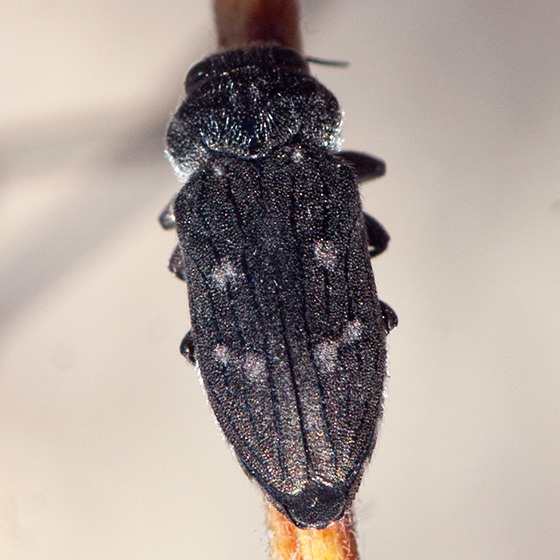 Update: Richard Westcott, who identified this beetle to species, notes that "the occurrence of this species on wild buckwheat undoubtedly is incidental, not indicative of a host plant. All known host plans are composites, family Asteraceae." Thanks so much for the species identification! I’m glad to be able to contribute some images of this species in the wild. I added your comment about host plants to the description above. We do have plenty of Asteraceae at the field station, as you can see from our plant list. Moved from Metallic Wood-boring Beetles. Thanks so much! This will be a new taxon for our field station invert list. Thanks! It semms like I was on the right track as to the family. I hope an expert will be able to take it little further.